That confused little chick who thought the world was coming to an end. Poor girl was foolish enough to follow the crowd. 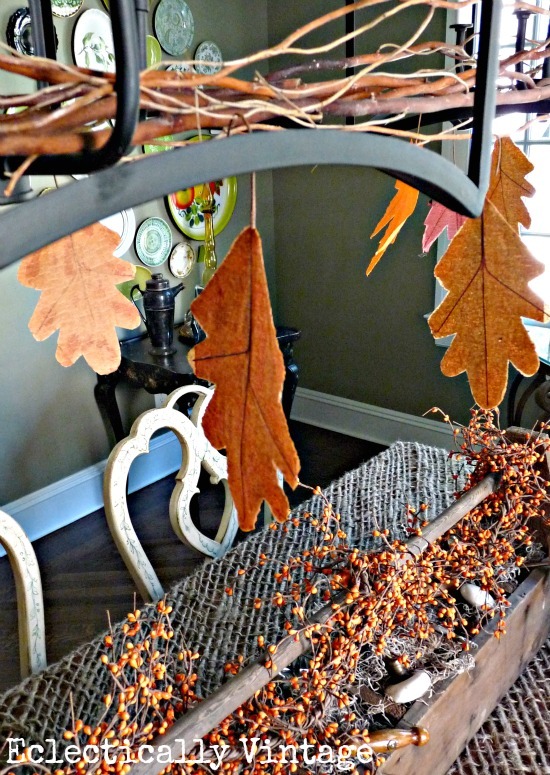 What does this have to do with fall centerpieces you may be asking yourself? I mean, would you trust someone named Cocky Locky? But you know the ending of this story isn’t a happy one. she fled back home never to be heard from again. I hear that just the rustle of leaves gives her nightmares nowadays. By the way, I got those cute leaves from the dollar store and the “tablecloth” is actually netting used by landscapers! I think Foxy Loxy would approve. Check out more of my dining room. Is that real bittersweet branches? Love the bittersweet for fall. Tip in using the real bittersweet as decoration:…… spray heavily with an inexpensive hair spray before adding the branches to arrangements. The hair spray will hold the berries in place longer. Great tip Colleen – but this bittersweet is fake! Saving the hairspray for my Jersey girl do!! Landscaping netting tablecloth…… I believe that is a first, and I like it. No I would not trust anyone named Cocky Locky. 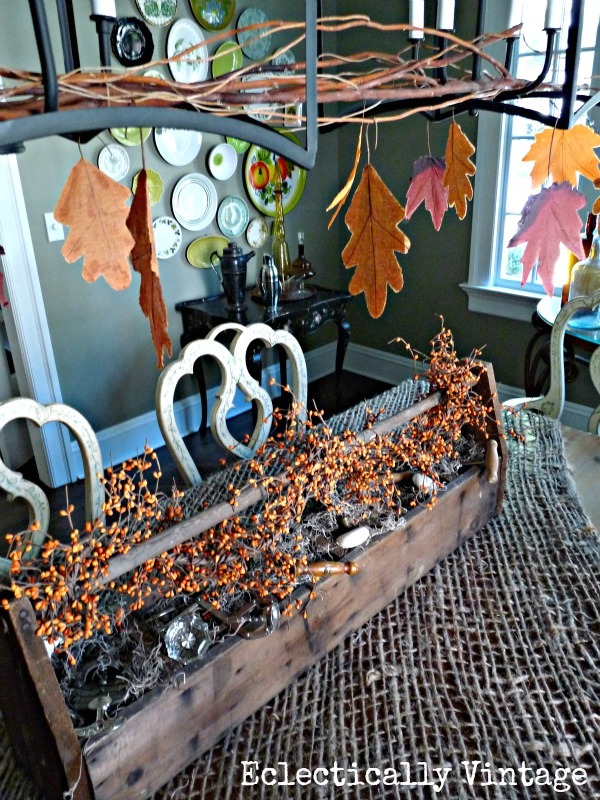 Beautiful centerpiece and love the “table cover”…..I love using chicken wire on my tables…I am sure Chicken Little would approve….Love that awesome tool box!! I only vaguely remember this storyline. I really think Chicken Little was a guy though. that landscape netting is so awesome! and dollar store leaves, perfect! I love it! The bittersweet is gorgeous! I’d like to invite you to join my party, Twirl & Take a Bow at http://www.houseontheway.com. I think this would be perfect! Absolutely LOVE i! Love your rustic, fall look! Perfection. The table cloth is genius too. Love everything but that table cover is SO inspiring!! Very clever! 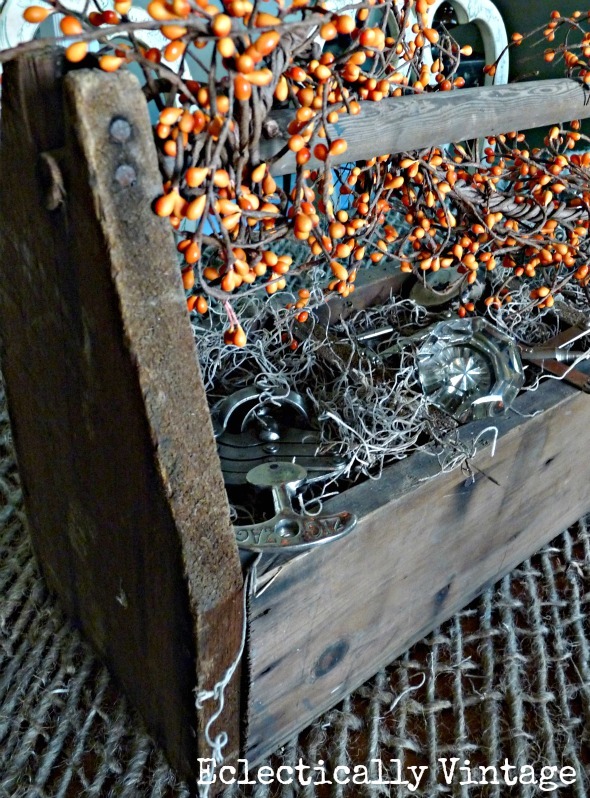 Anything that involves old tool boxes, keys and door knobs – I’m in! I the queen of “junque” totally approve. 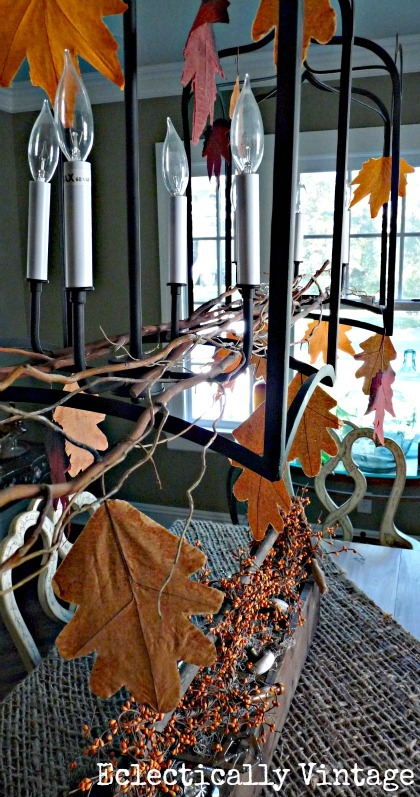 What a cue idea to have the Leaves hanging from the Chandelier! This is my kind of decorating. Quick and makes a statement. It all looks wonderful! And pulls together very well…love it! Hi there- I love the old tool box – you’ve inspired me to go and get somethings out and do a little decorating (even though we are still hip deep in bathroom renovations). I can still make a pretty spot in the middle of the chaos, right?! Your centerpiece is just perfect for autumn, along with the touches you added to your light fixture.It’s a very sweet and rustic look! Love it!! Those branches and leaves look fabulous hanging from those pretty lanterns! Love your old tool box! Everything is lookin lovely. Cute Post! Love the vignette! The landscaping netting adds the perfect touch! Love the toolbox and doorknobs. Fun and festve! Of course this is just a fave of mine!! Love the “falling” leaves! just perfect! 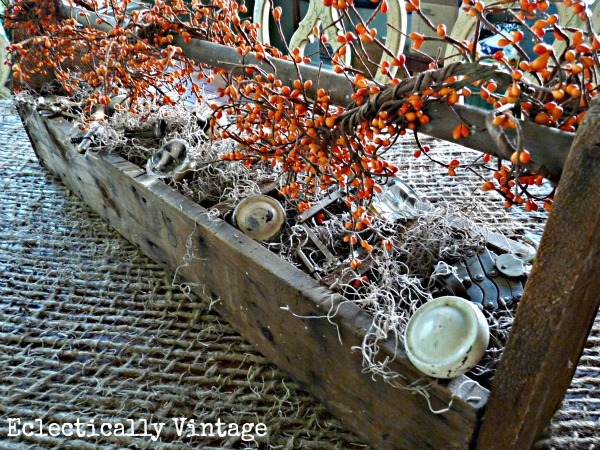 I’ll be featuring this post on Vintage Inspiration this week. Thanks so much for coming to the party! hi Kelly … looks great … the leaves hanging from the chandelier is a special touch. Love anything with an old tool box. New fan here……love this all. Im a sucker for any kind of vintage box or crate or carrier…this one is awesome. Great job….I will be stalking (ooops admiring) lol your blog often.